I'm finally getting to the dark colours, the ones that will give some actual shape to the neon rainbow that is my print. First the dark red, which printed very badly. I think it's because the only red ink I could find was in the squeeze tubes, instead of the jars, so wasn't nearly as thick as the other colours, unfortunately. I ended up printing all the dark reds twice, but I neglected to take a photo after the second time, unfortunately. I do have one of the dark green, however. And that means there is only black to go! I want to give away one of these, so if you want one, leave a comment. 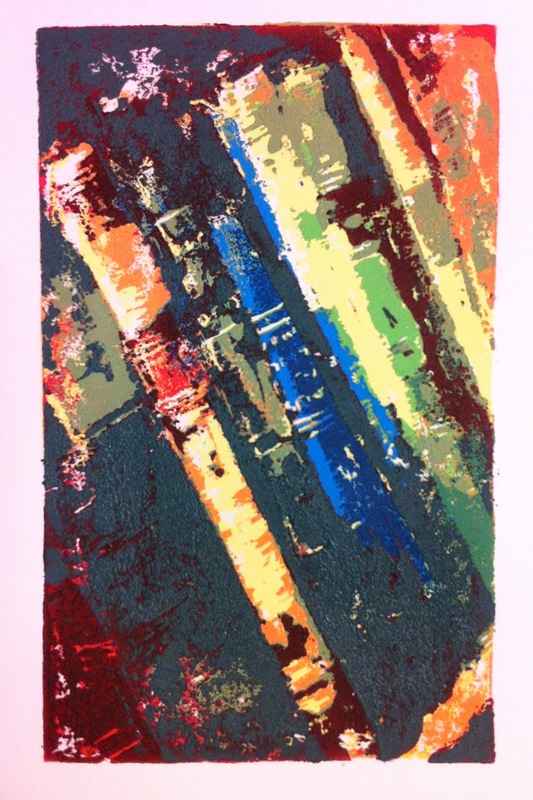 I love your work and am taking book binding classes after lusting after your stuff. Oooohh... reduction lino prints! I so want to try this. 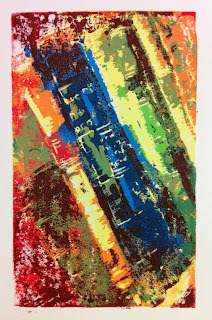 I'm off to Cascada Studio on 28th Jan, to take a couple of lino printing courses with the fabulous Mariann Johansen-Ellis (www.artcanbefun.com), so I hope to be brave enough to have a try at this fab technique. Her lino-cuts are wonderful - I'm a big fan! This looks as if it will turn out beautifully. I love the subject matter, as well as the gorgeous colour-range. I'm excited to see what you learn! I'm going to try and take a local seminar, because I'm just learning by trial and error right now, and would like a bit more knowledge. Doing it in Spain would be so much better though! i really love your painting its too good to see i think, red is looking something unique, I also wana do it in home and get the result then. really proud to be.